My friend gave me some of her extra flowers to use in my photo shoots. Well, needless to say I had a wonderful time using them in product photos and all around my house. So…I decided to do something different with the flowers. 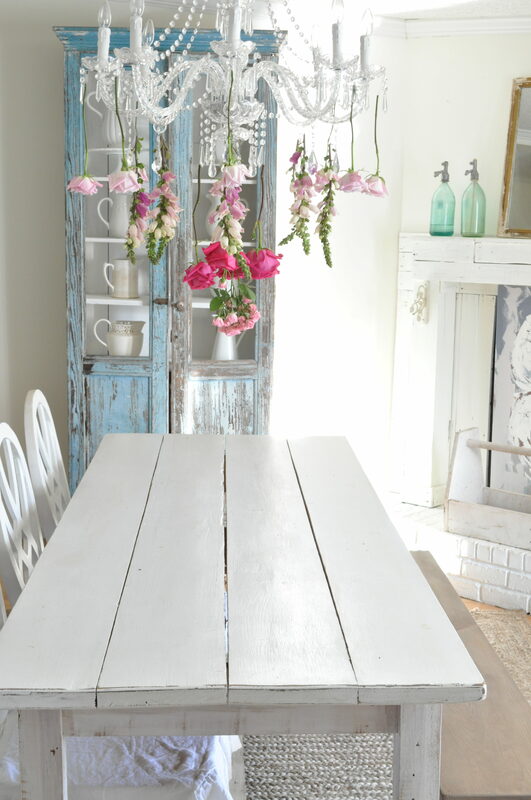 I thought it might be pretty to hang them from our chandelier over our farmtable. 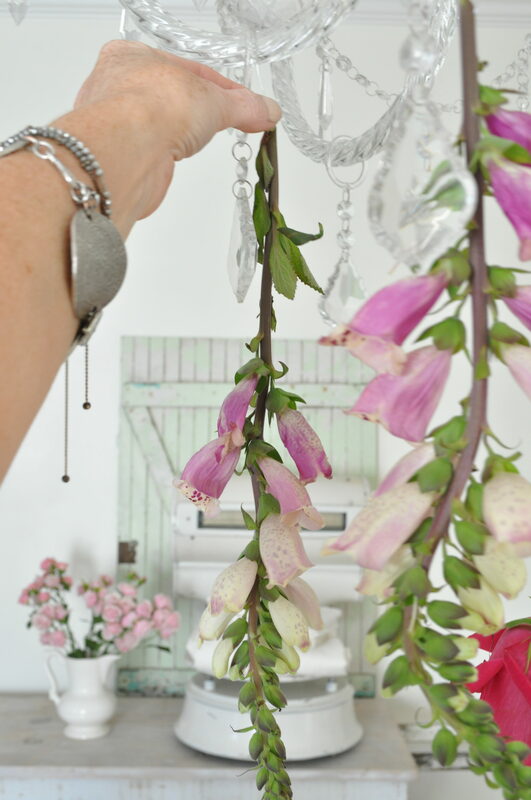 So…I thought I would just share the process of creating this flower chandelier, in case you would like to recreate it yourself. 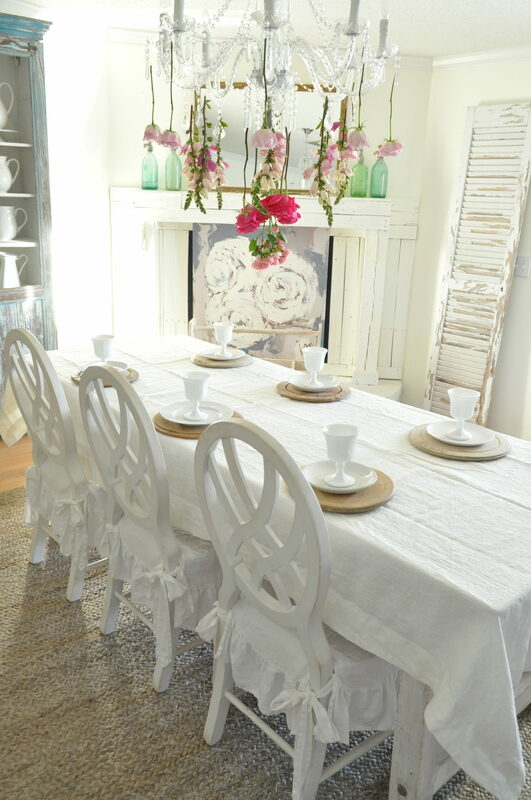 Wouldn’t it be pretty over a table for a bridal luncheon or baby shower? First, gather your flowers. 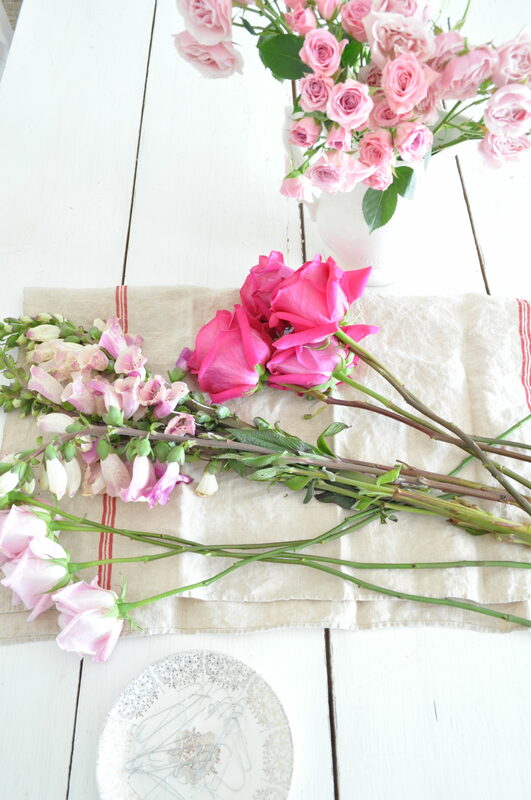 You can use different types of flowers, or all of one kind. I also used a package of bendable wire ornament hangers to hang each flower from the chandelier. I had spray roses, regular roses and foxgloves. And I wanted to alternate the flowers to create an eye-catching display. 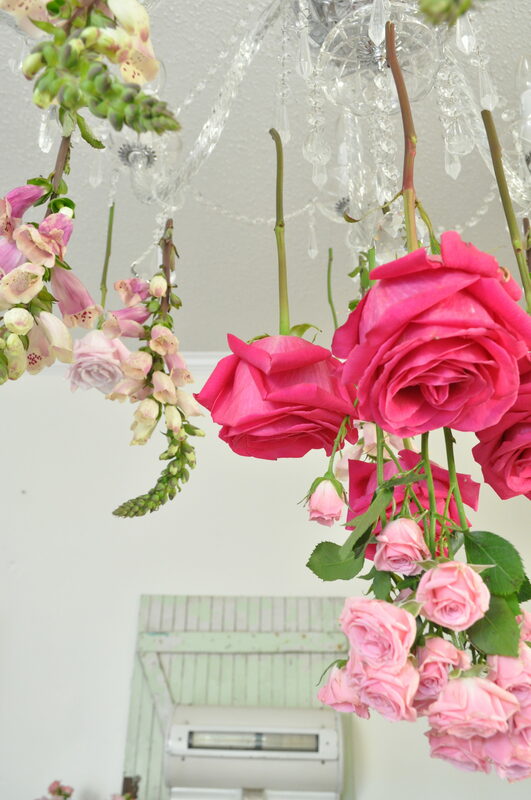 So I started with a bundle of spray roses, and added regular roses around…just by hanging each flower stem from the end of the hangers and hanging from the chandelier crystals. After the center bunch of roses, I did a row of foxgloves, and finished with pale pink roses on the outside row. 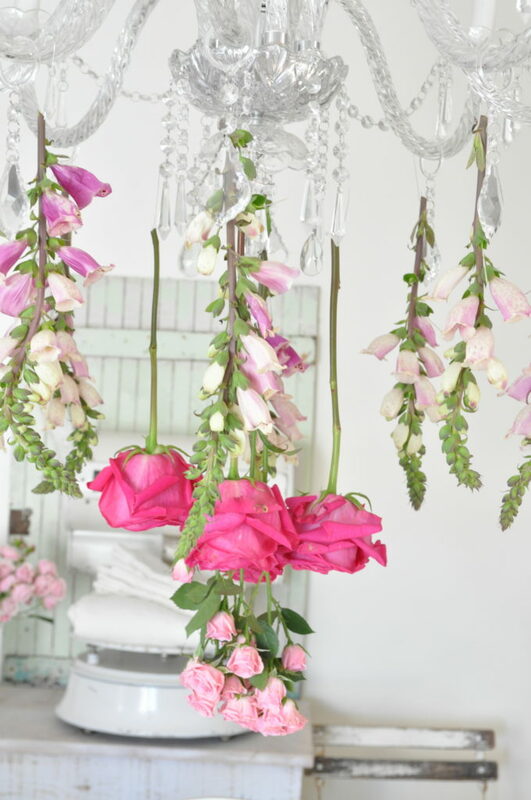 I cut the stems of each group of flowers approximately the same length, so they would be close to the same length while hanging down. Here’s a view looking up from the table. Aren’t the colors gorgeous? 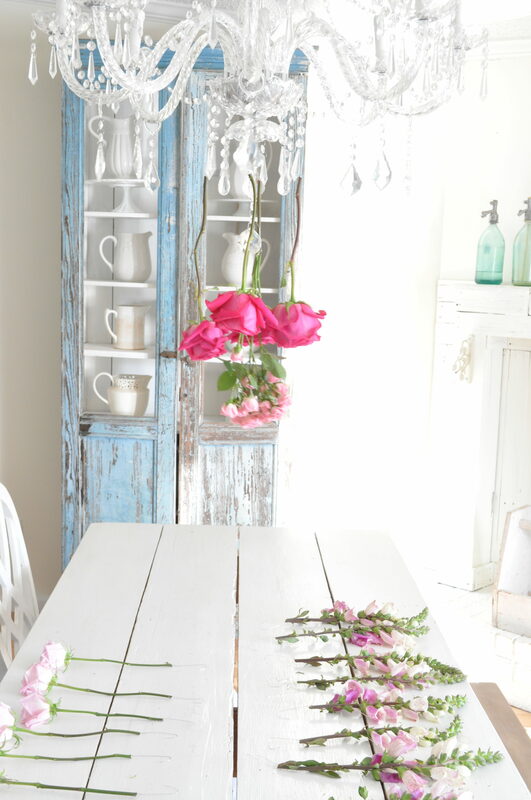 Just for fun, I set the table…using vintage bread boards as chargers and white dishes. The extra spray roses are placed in veggie crates as centerpieces. It’s a simple, elegant table. The gorgeous artwork leaning against the fireplace is from DEANN ART DESIGNS HERE and adds another pretty pop of color to our dining room. 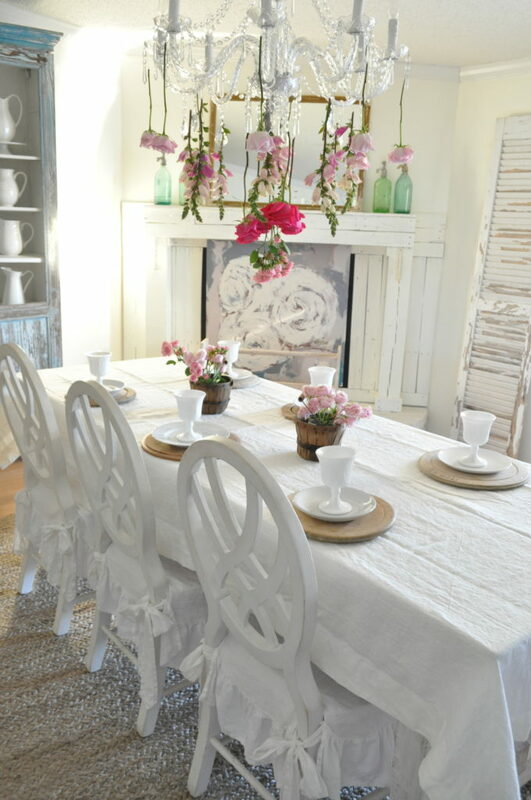 The linen white tablecloth is from ROUGH LINEN HERE and adds another layer of texture to the table. The ruffle chair slip covers are from POMPOM AT HOME and provide a bit of romantic country. This project can be done in just about an hour, start to finish. 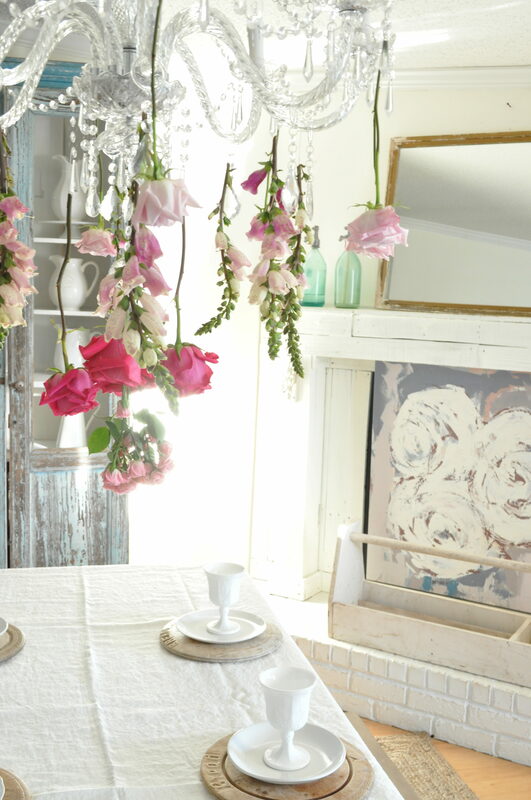 All you need is about 20-30 fresh flowers (faux would work too) and a package of ornament hangers. Oh, and a chandelier too. I’d LOVE to hear if you create one for your party, or shower, or just for fun to enjoy over your dinner table. 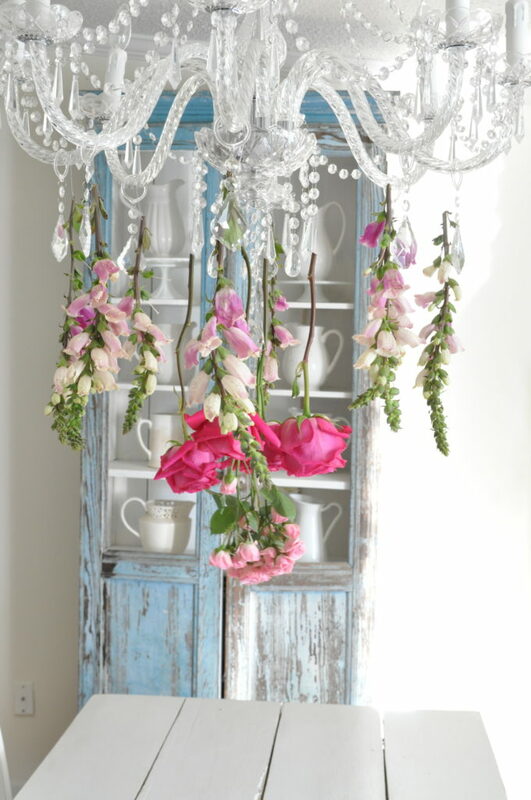 Let me know in the comments if you plan to create your own flower chandelier! And please follow along on INSTAGRAM HERE for daily updates and decor ideas.